AUSTIN, TX (August 8, 2018) -- The American Association of Nurse Practitioners (AANP) is excited to announce the results from its 2017 National Nurse Practitioner Sample Survey. This survey has been conducted periodically since 2007 with the purpose of capturing vital information regarding practice, compensation and benefits for nurse practitioners (NPs). Findings from the survey suggest full-time NPs, regardless of certification, reported an average hourly pay rate of $59.87. The average base salary for full-time NPs was $105,546, and the mean total income for full-time NPs was $112,923. NPs who worked full-time and were certified in adult mental health had the highest base salary, while Emergency NPs had the highest hourly rate and total income. 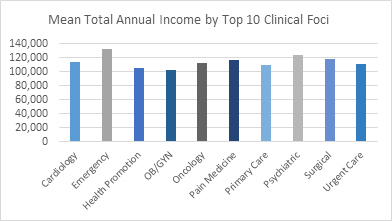 Information on total income by the top ten clinical foci is depicted in the figure below. Compared with previous years’ surveys, compensation gains were prevalent across several certification types. For example, from 2015 to 2017, the base salary for Geriatric NPs increased by 30 percent, while the base salary for Family NPs increased by 18 percent. Additional findings in the report include compensation by community population, certification, work setting, clinical foci and years of experience. NPs also reported the most important factors that influence their employment satisfaction and the benefits they receive from their worksite. The report does not include compensation by state, but regional fact sheets are available. On August 8 at 2:00 p.m. EDT, Michelle Cook, PhD, AANP’s VP of Research, will discuss the role of compensation in value-based care using the results of the survey. There is no charge to attend this webinar. She will also share strategies on how to ensure business accuracy through claims. The full 2017 National Nurse Practitioner Sample Survey Report is free to AANP members. Non-members can purchase the report in the online AANP research store for $50.00.